Our BIG day out is a BIG success! Wow! What an amazing day we had on Lihou Island yesterday for the Lihou Winter Arts Festival. 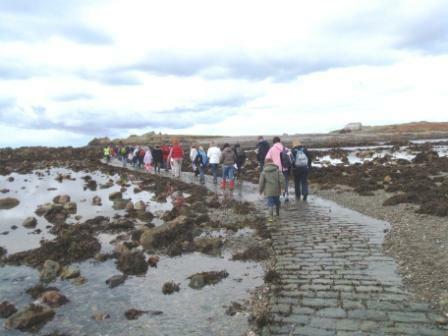 250 people joined us for a myriad of arts activities, explored the island and generally had a wonderful day out. We were blessed with dry weather, slight winds and even a bit of sun which meant that we could really make the most of the beautiful surroundings with many activities taking place outside. It was great to see everyone walking back to Guernsey proudly carrying their creations and with beaming smiles on their faces. A huge thanks from us too here at the GAC to everyone who helped out with the event in any way, and to the Lihou Charitable Trust for looking after us. We also have literally hundreds of photos from the day, many of which you will be able to see in our new exhibition, Lihou Lore, from 5th February in the greenhouse at the Guernsey Information Centre, open 9am – 5pm weekdays and 9am – 1pm on Saturdays. Best of all, it’s free! Come along and spot your family, or see what you missed out on. This entry was posted in Community Arts, the greenhouse and tagged Community Arts, the greenhouse, Workshops. Bookmark the permalink.